German Product - Made In Germany Only! On 15th June 2005, the Arnsberg (North Rhine-Westphalia/Germany) municipal utilities already started with the ambitious project engineering of a geothermal deep drilling. At the time of planning, the deepest drilling throughout Germany should bring in a maximum return of energy by using energy-efficient components, thus letting Arnsberg appear as a lighthouse of municipal energy economy. It was and is the aim of the drilling to produce 2.1 million kWh per year, which was to cover a large part of the heat load of the local “Nass” pleasure swimming pool. The functional principle is relatively simple: Cold water is transported into a big depth in a closed system by the consumer (here: the pleasure swimming pool). On the way down, the medium absorbs the ambient heat of the rocks. Geologists assume an increase of temperature of approx 3°K per 100 m. 83°C were measured at the bottom of the 2,835 m deep drilling in Arnsberg. The heated water is then to be returned to the surface without any heat loss. The heat is there extracted from the water by the consumer which is then conveyed into the depth in a cooled condition again. After having provided and started the drilling, this form of energy production is not only economical and climate-friendly, but also covers basic loads by the continuous operation, contrary to solar or wind energy. The deep geothermal drilling planned in Arnsberg was already realized in March 2008. 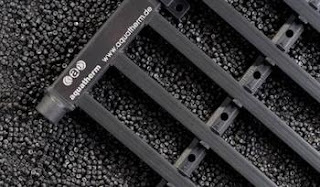 However, the efforts of a high energy-efficient extraction failed because of the deep geothermal inliner (return pipe) made of glass fiber reinforced duroplastic (GFK) planned at that time. The GFK double wall pipes intended by the project engineer did not resist the loads, therefore alternatives and innovations were looked for all over the world. For this plan which can be considered to be a prestige project, a deep geothermal probe had to be developed that can be proved to resist the static loads occurring during the installation in a 2,835 m deep drilling and to show optimal thermal properties during later operation. In a comparable project, the “Super C” deep drilling of RWTH Aachen / Germany (technical university with very high, international reputation), pilot tests with a polypropylene pipe were carried out some years ago. At that time, the tests failed because of the extremely high tensile and pressure forces occurring during installation, which could not be absorbed by the PP used. Despite of the highly scientific competence, the deep drilling is not in the planned condition of operation to this day. We became aware of the problem in Arnsberg by the media and directly got in touch with the local authority and the drilling firm Daldrup & Söhne (Westphalia), always being convinced to find a solution with our experience and technical thinking. 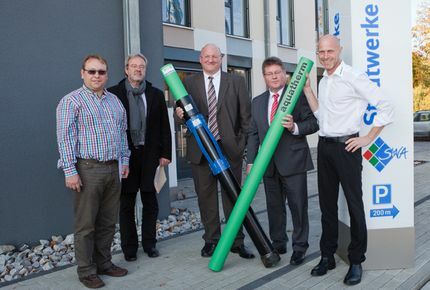 After the result of development, an absolute world first, had positively passed various tests at the institute for crude oil and natural gas technology of the Clausthal technical college, the composite pipe was presented to the Arnsberg municipal authorities. The composite pipe consists of a steel pipe (outer pipe) and an aquatherm PP inliner. By that it will be ensured that both mechanical and energetic requirements will be met. Exemplary, the PP pipe’s behavior was tested in an autoclave (pressure-temperature chamber) at a temperature of 95°C and a pressure of 320 bar. These are real conditions at the bottom of a deep drilling. The project team now assumes that the installation works will still be finished this year and then deliver heat energy for the “Nass” pleasure swimming pool nearby. The project is pioneering for deep geothermics. Numerous other projects will profit from the findings that are gained in Arnsberg; and that not only in Germany, but worldwide. สมาคม bvfa ได้มอบการชื่นชมกว่า 40 วัสดุด้วยรางวัลตราประทับ "Sprinkler Protected" และรวมถึงสภาปัติยกรรมสิ่งปลูกสร้างอื่นๆเช่น Allianz Arena ใน Munich, The Reichstag หรือ O2 World ใน Berlin วัสดุและสิ่งปลูกสร้างจะได้ถูกเสนอชื่อสำหรับรางวัลจะต้องอยู่ในขอบเขตและกฎเกณฑ์ที่เข้มงวด อาคารจะต้องอยู่ในสภาพที่สมบูรณ์ ครบครันด้วยระบบป้องกันอัคคีภัย ในแต่ละปีสมาคม bvfa - Bundesverband Technischer Brandschutz e.V. รับพิจารณาเพียง 3 สถาปัตยกรรม/อาคาร ที่ได้ถูกเสนอชื่อในประเทศเยอรมัน สำหรับรายชื่อผู้โชคดีได้รับรางวัลก่อนหน้านี้กรุณาเยี่ยมชมเว็บไซต์ www.bvfa.de - Infothek / Sprinker Protected. The Vitra House in Weil on the Rhine, situated on the campus of the world-renowned Vitra designer forge, will be awarded the stamp of quality “Sprinkler Protected” for excellent fire protection by a sprinkler system. “The stacked house”, a sensational object of the architects Jacques Herzog and Pierre de Meuron, fascinates both by the eccentric construction and the quality of the inner rooms. The spectacular object and its visitors are exemplarily protected by a suspending sprinkler system with aquatherm plastic sprinkler pipes installed in the ceiling. Regarding fire protection, the world-famous Vitra designer forge has exemplarily equipped its latest showpiece on the Vitra campus. “The stacked house” is provided with 486 sprinklers. Fire protection thus stretches over all the building. Since 1993, the bvfa – Bundesverband Technischer Brandschutz e.V. 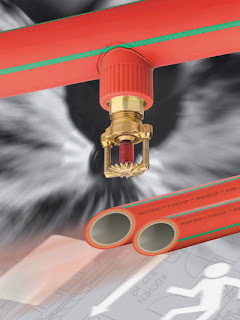 (federal association of technical fire protection) has awarded the stamp of quality “Sprinkler Protected” to buildings that guarantee the protection of human life by an extensive fire protection. 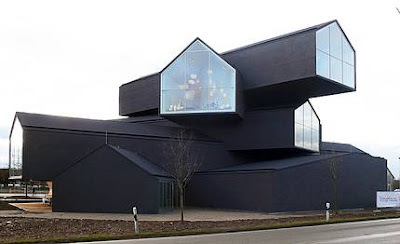 In March 2010, the Vitra House, a sensational object of the architects Jacques Herzog and Pierre de Meuron, was released to the public. The building fascinates both by the eccentric construction and the quality of the inner rooms where Vitra presents the new Vitra collection of furnitures. Concept and function, material and processing are impressing here. Just these demands were set on fire protection, too. The spectacular object and its visitors are exemplarily protected by a suspending sprinkler system with aquatherm firestopâ plastic sprinkler pipes installed in the ceiling. The bvfa has already paid tribute to more than 40 exposed objects with the “Sprinkler Protected” award, which among other things the Allianz Arena in Munich, the Reichstag or the O2 World in Berlin belong to. Objects that are proposed for the award have to fulfill strict criteria. The building has to be in a perfect condition regarding fire protection. The bvfa – Bundesverband Technischer Brandschutz e.V. annually confers the award to up to three chosen objects in Germany. For previous award-winners, please visit the website www.bvfa.de – Infothek/Sprinker Protected. The bvfa – Bundesverband Technischer Brandschutz e.V. is the decisive association for preventive and defensive, technical fire protection in Germany. The leading German suppliers of fixed and mobile fire protection technology and of fire protecting systems for buildings are represented in the association. The association that currently represents about 120 companies was founded in 1972 and is resident in Würzburg. An independent expert jury, consisting of representatives and owners of well-known specialist workshops judge numerous product developments from the trade on the occasion of the memo 2011 (16th – 17th September 2011). Based on a specially developed evaluation system, with the categories of engineering and design, the jury, conducted by Dipl. Wirt.-Ing. Zsolt Krèmer, managing director of the established Technomar GmbH, Munich, determines best trade innovations. Functionality, quality, cost-performance ratio, market chances and benefits for users were in the focus of the evaluation by the jury members. After all, the company group aquatherm was pleased about a further award at the memo 2011 evening of industry which was awaited full of suspense. Dipl. Wirt.-Ing. 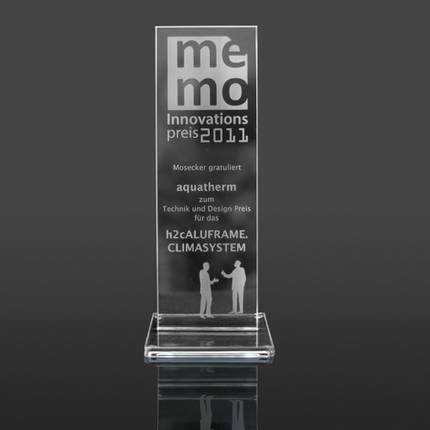 Zsolt Krèmer handed the first innovation award of Mosecker GmbH & Co. KG over to the sales manager Christof Schmidt for the new h2c system. During the Euro Shop in , the design-oriented heating and cooling system already left its numerous competitors behind in the category “product of high architectural quality” and walked off with the AIT innovation award 2011.